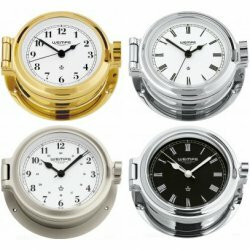 WEMPE porthole clocks impress with their unique marine design that - as the name indicates - corresponds to the portholes of ships. They give you the feeling of proximity to the sea, even when your in the office or in your own living room. Therefore, WEMPE porthole clocks are popular gifts for passionate sailors. The WEMPE porthole clocks are extraordinary pieces and part of various chronometer movements. In the REGATTA Series, for example, they are available with black or white flag-themed clock faces. WEMPE's porthole clocks are available with either Roman or Arabic numerals in all series. The housings vary from matt nickel-plated in the CUP Series to chrome-plated with an elegant black clock face in the NAUTICAL Series.